So far, we have concentrated on prevailing circulations. Now, let's turn to migrating tropical weather producers—the shear line, trough aloft, tropical wave, and tropical cyclone. A wind shear line found in the Tropics mainly results from midlatitude influences. In chapter 8 we stated that an air mass becomes modified when it flows from its source region. By the time a cold air mass originating in high latitudes reaches the Tropics, temperature and moisture are virtually the same on both sides of the front. A shear line, or wind shift, is all that remains. 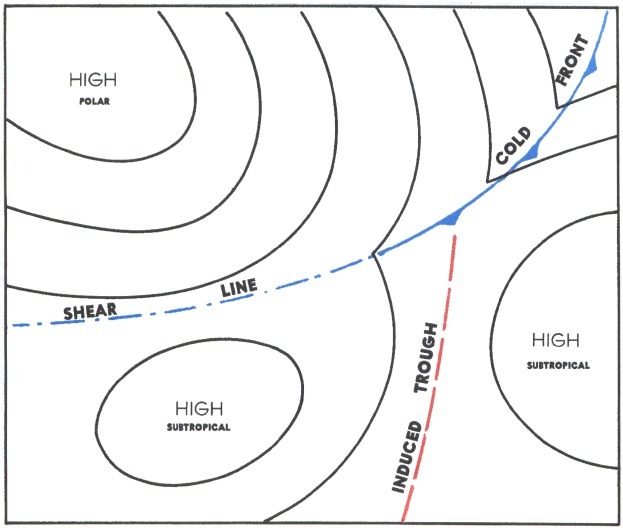 A shear line also results when a semi-permanent high splits into two cells inducing a trough as shown in figure 140. FIGURE 140. A shear line and an induced trough caused by a polar high pushing into the subtropics. 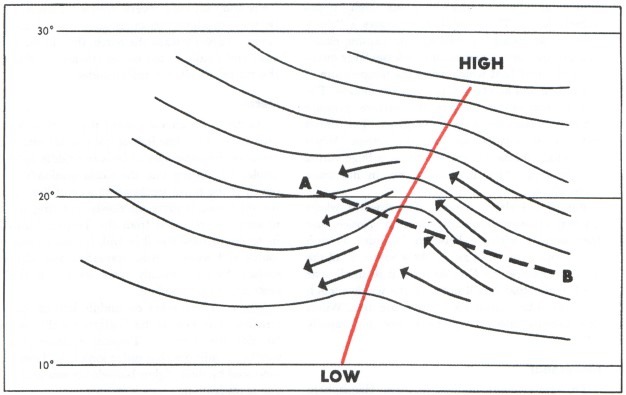 These shear lines are zones of convergence creating forced upward motion. Consequently, considerable thunderstorm and rain shower activity occurs along a shear line. Troughs in the atmosphere, generally at or above 10,000 feet, move through the Tropics, especially along the poleward fringes. 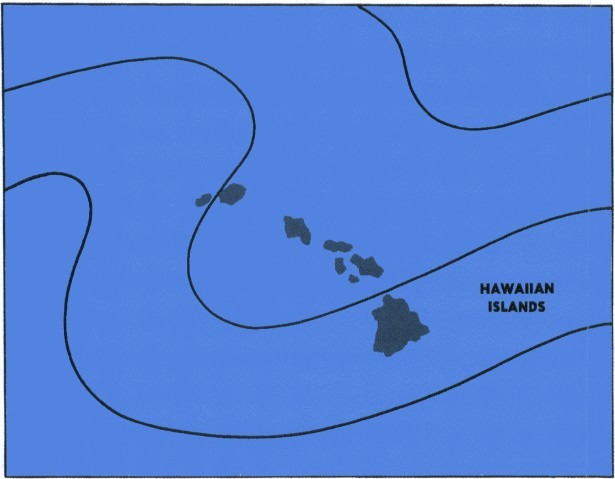 Figure 141 shows such a trough across the Hawaiian Island chain. As a trough moves to the southeast or east, it spreads middle and high cloudiness over extensive areas to the east of the trough line. Occasionally, a well-developed trough will extend deep into the Tropics, and a closed low forms at the equatorial end of the trough. The low then may separate from the trough and move westward producing a large amount of cloudiness and precipitation. If this occurs in the vicinity of a strong subtropical jet stream, extensive and sometimes dense cirrus and some convective and clear air turbulence often develop. FIGURE 141. A trough aloft across the Hawaiian Islands. Extensive cloudiness develops east of the trough. Troughs and lows aloft produce considerable amounts of rainfall in the Tropics, especially over land areas where mountains and surface heating lift air to saturation. Low pressure systems aloft contribute significantly to the record 460 inches average annual rainfall on Mt. Waialeale on Kauai, Hawaii. Other mountainous areas of the Tropics are also among the wettest spots on earth. Tropical waves (also called easterly waves) are common tropical weather disturbances, normally occurring in the trade wind belt. In the Northern Hemisphere, they usually develop in the southeastern perimeter of the subtropical high pressure systems. They travel from east to west around the southern fringes of these highs in the prevailing easterly circulation of the Tropics. Surface winds in advance of a wave are somewhat more northerly than the usual trade wind direction. As the wave approaches, as shown in figure 142, pressure falls; as it passes, surface wind shifts to the east-southeast or southeast. The typical wave is preceded by very good weather but followed by extensive cloudiness, as shown in figure 143, and often by rain and thunderstorms. The weather activity is roughly in a north-south line. FIGURE 142. A Northern Hemisphere easterly wave. Progressing from (A) to (B), note that winds shift generally from northeasterly to southeasterly. The wave moves toward the west and is often preceded by good weather and followed by extensive cloudiness and precipitation. FIGURE 143. Vertical cross section along line A—B in figure 142. Tropical waves occur in all seasons, but are more frequent and stronger during summer and early fall. Pacific waves frequently affect Hawaii; Atlantic waves occasionally move into the Gulf of Mexico, reaching the U.S. coast. Hurricane or Typhoon—highest sustained winds 65 knots (120 km/h) or more. Strong tropical cyclones are known by different names in different regions of the world. A tropical cyclone in the Atlantic and eastern Pacific is a “hurricane”; in the western Pacific, “typhoon”; near Australia, “willy-willy”; and in the Indian Ocean, simply “cyclone.” Regardless of the name, these tropical cyclones produce serious aviation hazards. Before we delve into these aspects, let's look at the development, movement, and decay of these cyclones. Prerequisite to tropical cyclone development are optimum sea surface temperature under weather systems that produce low-level convergence and cyclonic wind shear. Favored breeding grounds are tropical (easterly) waves, troughs aloft, and areas of converging northeast and southeast trade winds along the intertropical convergence zone. The low level convergence associated with these systems, by itself, will not support development of a tropical cyclone. The system must also have horizontal outflow—divergence—at high tropospheric levels. This combination creates a “chimney,” in which air is forced upward causing clouds and precipitation. Condensation releases large quantities of latent heat which raises the temperature of the system and accelerates the upward motion. The rise in temperature lowers the surface pressure which increases low-level convergence. This draws more moisture-laden air into the system. When these chain-reaction events continue, a huge vortex is generated which may culminate in hurricane force winds. Figure 144 shows regions of the world where tropical cyclones frequently develop. Notice that they usually originate between latitudes 5° and 20°. Tropical cyclones are unlikely within 5° of the Equator because the Coriolis force is so small near the Equator that it will not turn the winds enough for them to flow around a low pressure area. Winds flow directly into an equatorial low and rapidly fill it. FIGURE 144. Principal regions where tropical cyclones form and their favored directions of movement. Tropical cyclones in the Northern Hemisphere usually move in a direction between west and northwest while in low latitudes. As these storms move toward the midlatitudes, they come under the influence of the prevailing westerlies. At this time the storms are under the influence of two wind systems, i.e., the trade winds at low levels and prevailing westerlies aloft. Thus a storm may move very erratically and may even reverse course, or circle. Finally, the prevailing westerlies gain control and the storm recurves toward the north, then to the northeast, and finally to the east-northeast. By this time the storm is well into midlatitudes. As the storm curves toward the north or east, it usually begins to lose its tropical characteristics and acquires characteristics of lows in middle latitudes. Cooler air flowing into the storm gradually weakens it. If the storm tracks along a coast line or over the open sea, it gives up slowly, carrying its fury to areas far removed from the Tropics. However, if the storm moves well inland, it loses its moisture source and weakens from starvation and increased surface friction, usually after leaving a trail of destruction and flooding. When a storm takes on middle latitude characteristics, it is said to be “extratropical” meaning “outside the Tropics.” Tropical cyclones produce weather conditions that differ somewhat from those produced by their higher latitude cousins and invite our investigation. While in its initial developing stage, the cyclone is characterized by a circular area of broken to overcast clouds in multiple layers. Embedded in these clouds are numerous showers and thunderstorms. Rain shower and thunderstorm coverage varies from scattered to almost solid. Diameter of the cloud pattern varies from less than 100 miles in small systems to well over 200 miles in large ones. As cyclonic flow increases, the thunderstorms and rain showers form into broken or solid lines paralleling the wind flow that is spiraling into the center of the storm. These lines are the spiral rain bands frequently seen on radar. These rain bands continually change as they rotate around the storm. Rainfall in the rain bands is very heavy, reducing ceiling and visibility to near zero. Winds are usually very strong and gusty and, consequently, generate violent turbulence. Between the rain bands, ceilings and visibilities are somewhat better, and turbulence generally is less intense. The “eye” usually forms in the tropical storm stage and continues through the hurricane stage. In the eye, skies are free of turbulent cloudiness, and wind is comparatively light. The average diameter of the eye is between 15 and 20 miles, but sometimes is as small as 7 miles and rarely is more than 30 miles in diameter. Surrounding the eye is a wall of cloud that may extend above 50,000 feet. This “wall cloud” contains deluging rain and the strongest winds of the storm. Maximum wind speeds of 175 knots have been recorded in some storms. 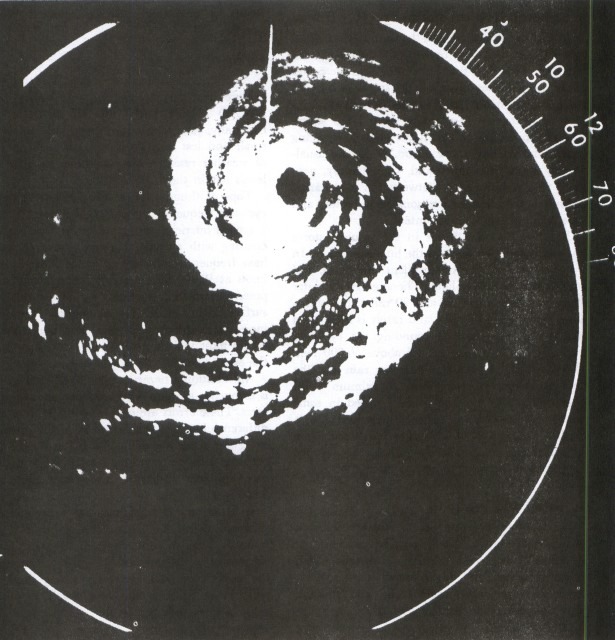 Figure 145 is a radar display and 146, a satellite photograph of a mature hurricane. Note the spiral rain bands and the circular eye. Notice the similarity between these two figures. FIGURE 145. 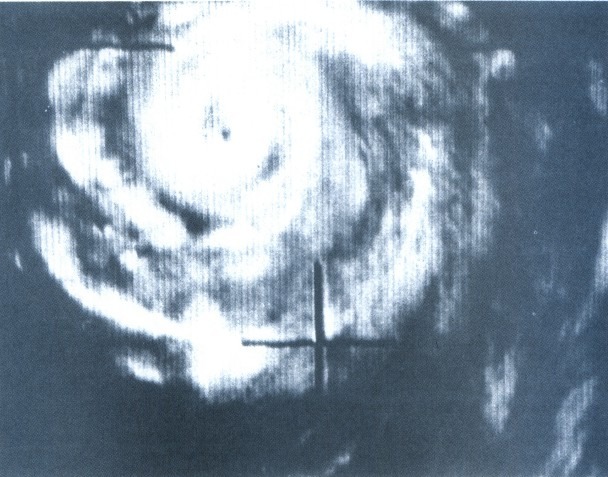 Radar photograph of hurricane “Donna” observed at Key West, Florida. FIGURE 146. A hurricane observed by satellite. The National Weather Service has a specialized hurricane forecast and warning service center at Miami, Florida, which maintains constant watch for the formation and development of tropical cyclones. Weather information from land stations, ships at sea, reconnaissance aircraft, long range radars, and weather satellites is fed into the center. The center forecasts the development, movement, and intensity of tropical cyclones. Forecasts and warnings are issued to the public and aviation interests by field offices of the National Weather Service. All pilots except those especially trained to explore tropical storms and hurricanes should AVOID THESE DANGEROUS STORMS. Occasionally, jet aircraft have been able to fly over small and less intense storms, but the experience of weather research aircraft shows hazards at all levels within them. 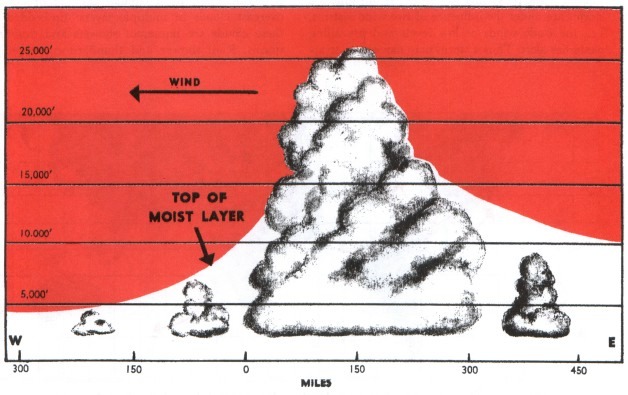 Tops of thunderstorms associated with tropical cyclones frequently exceed 50,000 feet. Winds in a typical hurricane are strongest at low levels, decreasing with altitude. However, research aircraft have frequently encountered winds in excess of 100 knots at 18,000 feet. Aircraft at low levels are exposed to sustained, pounding turbulence due to the surface friction of the fast-moving air. Turbulence increases in intensity in spiral rain bands and becomes most violent in the wall cloud surrounding the eye. An additional hazard encountered in hurricanes is erroneous altitude readings from pressure altimeters. These errors are caused by the large pressure difference between the periphery of the storm and its center. One research aircraft lost almost 2,000 feet true altitude traversing a storm while the pressure altimeter indicated a constant altitude of 5,000 feet. In short, tropical cyclones are very hazardous, so avoid them! To bypass the storm in a minimum of time, fly to the right of the storm to take advantage of the tailwind. If you fly to the left of the storm, you will encounter strong headwinds which may exhaust your fuel supply before you reach a safe landing area.